Use this chart to help identify your strings on your violin, viola, cello, or double bass. Some gut strings do not have a ball end but are just tied off instead. 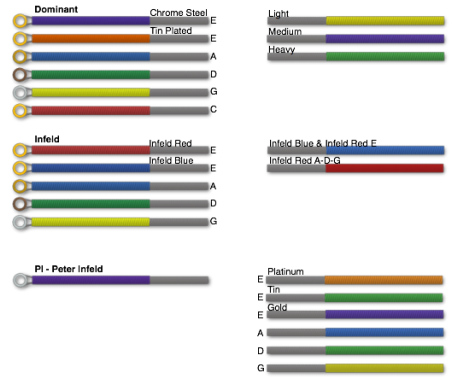 Many E strings will not have two colors on the tail end of the string. The color will be usually be one of the two shown. 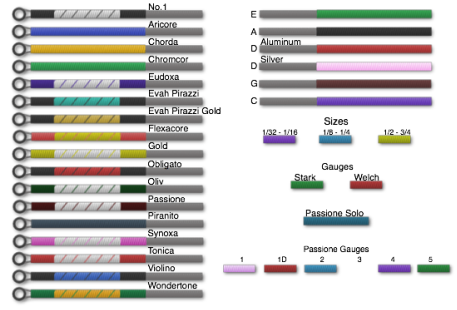 The extra strips shown are known as "peg rings". These are added to the silk wrapping on the peg end of the string to indicate different gauges, sizes, or different variations of the same string. eg. A Heavy gauge Helicore E string will not be blue/yellow at the tail end, but instead just blue. The peg end will not just be green, but also have and extra orange wrapping. Having trouble viewing the strings? Want to have a paper copy of the chart? If there is anything that is missing, or incorrect please contact me so I may update the chart.